The puzzle piece mosaic looks a bit like jigsaw puzzle pieces, but it’s not puzzling to knit. 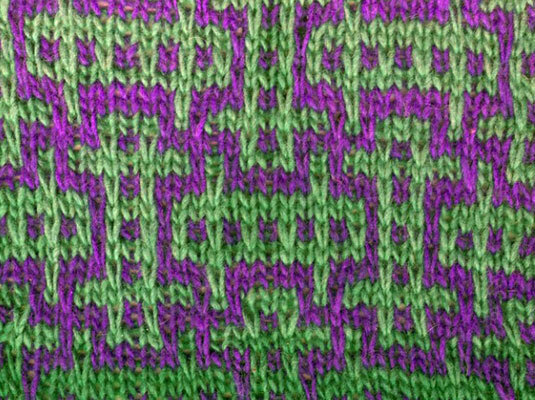 The puzzle piece mosaic is quite predictable; you’ll soon discover a rhythm to knitting this pattern after a bit of practice. The written directions for this 16-stitch mosaic are designed for knitting in the round. Because you’re knitting in the round, you’ll find it easy to keep things lined up. If you’re using this pattern to knit flat, add the 3 selvedge stitches shown in the chart below (1 at the beginning of the row and 2 at the end of the row) to complete the pattern. If you’re using the charted pattern to work in the round, read only the 16-stitch pattern repeat that is outlined with the dark border. Cast on 35 stitches with CC. 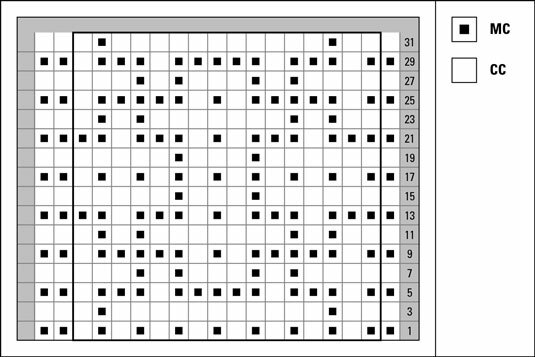 Follow this chart or stitch pattern. Set-up rounds: Knit 2 rounds with CC. Round 1: With MC, *(k1, sl 1) 8 times, repeat from * to end. If a stitch was knit in the previous row (it will be the same color as the yarn in your hand), knit it (or purl it if you’re working back and forth). If a stitch was slipped in the previous row (it won’t be the color of the yarn in your hand), slip the stitch purlwise with the yarn held to the wrong-side of the work. Round 3 and 31: With CC, *k2, sl 1, k11, sl 1, k1, repeat from * to end. Round 5 and 29: With MC, *k1, sl 1, k3, sl 1, k5, sl 1, k3, sl 1, repeat from * to end. Round 7 and 27: With CC, *k4, sl 1, k1, sl 1, k3, sl 1, k1, sl 1, k3, repeat from * to end. Round 9 and 25: With MC, *k1, sl 1, k5, sl 1, k1, sl 1, k5, sl 1, repeat from * to end. Round 11 and 23: With CC, *k2, sl 1, k1, sl 1, k7, sl 1, k1, sl 1, k1, repeat from * to end. Round 13 and 21: With MC, *k3, sl 1, k3, sl 1, k1, sl 1, k3, sl 1, k2, repeat from * to end. Round 15 and 19: With CC, *k6, sl 1, k3, sl 1, k5, repeat from * to end. Round 17: With MC, *(k1, sl 1) 8 times, repeat from * to end. Repeat Rounds 1–32 for pattern.